Interest in freight-related startups and technology continues to grow, as evidenced by several recent investment deals as well as a first-of-its-kind Founders Camp whereby representatives from 20 startup firms met with trucking executives and shippers in Chattanooga, Tenn., to exchange ideas for new products and services. Among investment deals, the companies receiving new financial backing are: Austin, Texas-based Shipwell, which offers an automated electronic platform for handling freight transactions; Freightos, a company based in Israel that provides pricing data for users of freight forwarding services; and Postmates, a San Francisco-based delivery firm. After getting $2.1 million in seed funding in 2017, Shipwell received an additional $10 million in Series A funding in October from a group of investors led by California-based Fifth Wall Ventures. Shipwell co-founder Jason Traff, in a blog post, said the new funding will help the company achieve three goals: spreading the word about the business, improving the product and amplifying the team with new hires. “Our mission is to make freight shipping delightful,” Traff noted. Freightos raised $44.4 million to continue expanding its on-demand global freight platform. The latest round of funding was led by the Singapore Exchange, which will work with the company to develop a digital marketplace for freight transactions. Freightos was launched in 2016 and now has raised $94.4 million. “SGX is excited by the potential to develop risk management tools and services ... to bridge the physical and financial markets,” said Michael Syn of SGX. Postmates collected $300 million from a group of investors led by Tiger Global Management, and will use the money to broaden its coverage area to 70% of U.S. households, develop a new point-of-sale integration tool and offer white-glove delivery services to non-brick-and-mortar retailers. Launched in 2011, Postmates already operates in 400 cities in the United States, plus Mexico, and makes more than 3.5 million deliveries per month for 250,000 merchants. 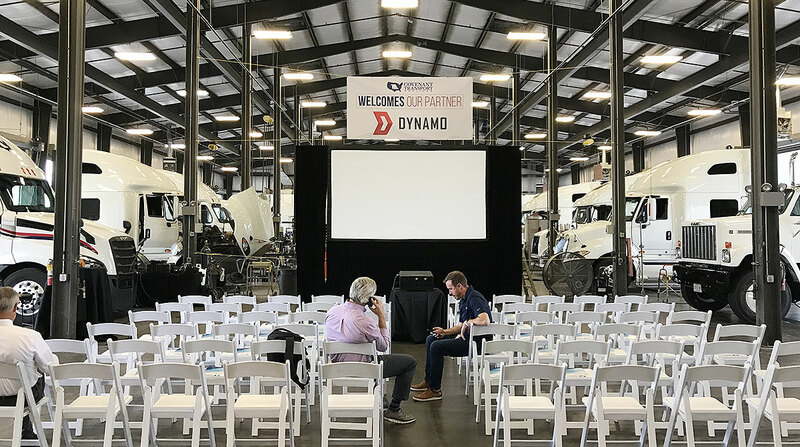 At Founders Camp the focus was not on funding but on helping startups gain insights by meeting with transportation and logistics executives during a weeklong networking event organized by Dynamo, a transportation-focused technology incubator. Covenant Transport Services, a publicly owned truckload motor carrier based in Chattanooga, hosted the group inside the company’s body shop where participants got a close-up look at the company’s first truck — a 1981 GMC day cab called Gertie — and the company’s latest acquisition: a 2019 model Freightliner. Over several days, company founders and industry executives exchanged ideas and shared tips on what it takes to succeed. Each startup team had 40 minutes to make a presentation. “It was little like speed dating,” according to Ryan Rogers, chief transformation officer at Covenant, who said he came away with information on three to five startups that could be useful in its trucking and logistics businesses. Participants offered products and services ranging from truck safety and warehouse automation to trade finance and insurance.